Planting curcuma bulbs left me with a feeling of, “I hope we did that right.” Slightly unsure, but pretty excited about the results. 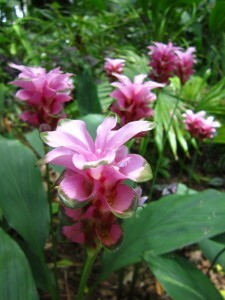 Curcuma are a beautiful group of flowering perennials for Florida, and as you can see here, the results are stunning. I’ve seen these offered for sale as potted plants at several of our local box stores, but I hadn’t had the opportunity to see them in this form. Curcuma bulbs look a lot like little octopuses. The top pointed part is the actual rhizome where new growth will emerge and the bulbous looking “tentacles” are modified roots for storage. Each variety is a different size, but the overall appearance is the same. The one shown here was nearly 5″ from top to bottom. 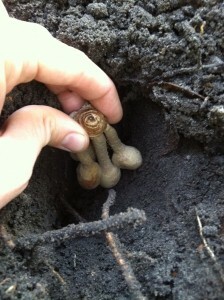 Honestly, the smaller bulbs were easier to plant because they didn’t need quite as large of a hole for planting! We started out by trying to find cultural information on how to plant these for best growth. Even the world wide web left us empty handed on this one! With our fingers crossed we planted these with the top of the bulb 2-3″ below the soil surface. After the holes were dug we simply held on to the top part of the bulb, extended the bulbous roots into the hole and proceeded to back fill with soil. We must have done something right because they look beautiful now. Sites were selected that receive a half day of sunlight or so, not extremely shady nor in full sun. The new growth emerged with a grass-like blade and within about seven weeks the flower spikes began to shoot up between the leaves. These plants are extremely tropical looking and get tons of comments from our guests. Curcuma is a plant that I would say “plays well with others” because of its ability to be mixed in with other plants well and it isn’t overly aggressive. This photo shows my absolutely favorite variety. This is Curcuma ‘Emerald Chocozebra Red’ and it has this unusual striping and a dark red color on the bottom of the flowers. This planting gets more sunlight than most of the others and I think this is the reason why this variety has been flowering so much over the past four months. I tend to like plants with unusual colors and patterns and it is about all I could do to leave them in the garden and not cut some for inside the house. 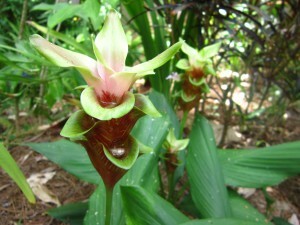 Is there a specific time to plant Curcuma in Florida? My Curcuma has wilted and dried out in the cold – not sure if it is lost forever? The best time is usually in the late spring when the soil starts to warm. Don’t be discouraged for your plants to go dormant for the winter! This is perfectly normal and they should come back next spring. I’ve planted the tuber bulb extensions individually and grew a new plant. So I’m not sure the whole octopus needs to go in…Try cutting off a couple and see. Each seed will make on plant. Not all seeds grow though, so plant more seeds than you need. When you plant your seeds, foollw the directions on the package. It will tell you how much dirt to put on top, how far to space each plant, and how long it will take for the seed to start growing. Water your plants whenever the soil feels dry. You don’t want to over-water them so just make sure the soil is always damp.The best planters to start seeds are small styrofoam cups. Poke a little hole in the bottom to let the extra water out. Put that cup inside another one, without a hole, to catch th ewater so it doesn’t make a mess. Good luck on your planting and on your project! Yes some do set seed. Others are sterile just depends on how they were bred. “Green-ice” for example the stunning tall paper white with bright green tips to the bracts is completely sterile but the bulbs multiply rapidly in the ground. Seeds form inside the cup shaped bracts in a little round fleshy capsule. When they are ready they become quite hard and some turn slightly purple red. They split and burst and the seed scatters and dribbles. Each about the shape and size of a small pomegranate seed. Each has a strange and lively white aril attached to it which acts as a spring. As the pod splits the arils expand suddenly and the seed sort of jumps, wiggles and creeps and trickles out, almost like they are some kind of creature. The aril itself looks alive like some kind of tiny animal. Its quite unique and great fun gently picking the capsules out of the dead bracts and splitting them gently over a pot of soil, make sure all the seed springs free as some gets packed in. They lightly wiggle over your fingers and drop onto the surface. Cover lightly in sand. Some germinate immediately, others a few weeks later and yet more only the next season or even longer. They don’t all germinate at once by design. It’s fascinating to see the different colours and bract forms as they grow. They freely cross with each other, or you can hand pollinate yourself. To make the flowers set pods leave the whole inflorecense on the stalk until it almost looks rotten, the pods keep growing even when the whole thing looks black, you can feel the hard little pods in the papery dried bracts. Dont remove the pods until the whole stalk itself starts dying or the seed will be immature. Alternatively if you leave it too long the seed escapes and will germinate around the existing clump but wont look like the parent. You can place a small sandwitch zip lock bag over the entire drying inflorecence to prevent this happening. Dead-heading makes more and bigger bulbs for next season so I just leave one or two clumps of each variety for seed. If you aren’t getting any capsules feed with lots of potassium, that generally works to get them setting pods. Potassium reduces the number of bulbs for next year so do it selectively on just one or two clumps of the same variety. Although you will get fewer bulbs this way they will be bigger, plumper though and you get the seed of course. Nitrogen speeds up bulb production with these so otherwise generally a 13-13-13 or equivalent balanced fert is the way to go. For capsule production 13-13-45 for example is best. Some flower within the second year, others takes up to three years until the bulbs are big enough from seed to flower. So its nice just having a large pot or bed idealy under 30% or less shade cloth filled with random seedlings. Any you like the look off don’t hesitate to dig up in flower and transplant to the sunniest spot available. Feed or mix into the soil a balanced osmocote, slow release and very quickly the same year it will send up multiple flowering shoots where you planted it. It doesn’t set them back at all and you will know which flower it is as opposed to digging and sorting bulbs in the resting season. If you plant in shade or part shade the mature bulbs will decrease and ultimatly dissapear, getting less each year. They need full sun, high humidity and high rainfall to do best. Seedling need a little protection the first few years, this they get in open very grassy fields of mature crucurmas in the wild. Some species like C. sparganifolia need more shade at the roots and are happier planted amongst other lower grasses or plants to keep the soil cooler but overhead shade is not much liked by any. The same for division. I do it in the growing season. Choose a nice overcast day and just fork up a clump when the first flowers appear and gently separate and plant the divisions and way they will go. Best to wait untill they are strongly growing, leaf and flowers. No need to separate each single bulb and flower stem. This way the bulbs multiply even faster in each division as its the growing season, they take off right away. Be careful not to break the arms off the “octopi”, just gently pull each clump apart with soil attached, plant at the same depth mixing in osmocote or other slow release and water well for a week or so depending on the rain. Dont over water and choose a free draining sunny site. A little bit of leaf curl is expected in very hot weather. If it’s rainy so much the better. Curcumas like a neutral to slightly alkaline soil so if your top soil is acidic from years of mulch and leaf litter, lime the area lightly as well. Generally their roots dont go deep enough to be affected by sub soil acidity or alkalinity so its the top soil that counts. Sandy free draining soil is the best for these bulbs, prevents rot and fungus and they can develop nicely into large healthy clumps, but will need fertilising at least once a year as sandy soil is also rather poor soil. I bought one in bloom at the local Home Depot. Never seen nor heard of it, but thought it was pretty and it said it was a Perennial. After about a week I noticed a Baby spike about 6 inches tall. I separated it from its parent and repotted it. 2 weeks later it is going strong! Annnd… there’s another baby growing -now about two inches above the soil- where I removed the first. I live in SE Louisiana and it is hot an very humid this summer. I’m not planting them in the ground this year because we actually had a cold and icy winter last year. I want to preserve them in hopes I can propagate again next spring and have even more. Maybe I will then put a couple in the garden to see how they fare in a normal Louisiana winter. what month should I plant these bulbs? I live in Central East Coast Florida. Also, where can I find a place to order them online? I would plant these in April or May. I am finding the more sun they get, the stronger the plants and flowers. I’ve purchased plants off of Ebay before and I also see that http://stokestropicals.plants.com/Search.aspx?k=curcuma has them available too. Keri your soil is perfect for curcurma and many other types of bulbs in fact. They love a good deep sandy soil. Yes for naturalising they are excellent, they grow wild in fields of grass. Some I’ve had no luck with but the same planted amongst ornamental grasses have thrived. Planted this way they are more graceful with longer slender leaves and longer though as strong stalks and lighter heads. In fact they can be planted amongst anything and reliably come up each season as long as they get a good half day full sun. They are also very nice planted amongst Arundina graminifolia that grass like orchid along with grasses creates a lovely tropical hill station grassland feel. I love the way yours are planted. Almost like on the edge of the forest. Im always looking out for ideas for these as I just can’t get enough, so Im going to try the same. It seems there is a never ending number of varieties coming out each year which is terrific especially for gardeners in our steamy climates. What is nice is that they are also quite cheap, people treat them like throw away pot plants but in fact they are extremely valuable and worthy permanent garden plants. No other flower like it our very own tulip of the tropics but nicer because they are a lot longer repeat bloomers, all summer in fact, the more rain and sunshine the happier. I think they look like water lilies and lotus flowers as they have that special luminescence. Malivin3-rutinoside is the pigment responsible. At dusk and dawn they change to the most stunning glowing orbs almost flurocent and during the day they are stunningly bright. During a good sunset they become positively bewitching they are so beautiful. Absolutely love them. Thanks for the inspiration. I bought a beautiful Curcuma plant this year. I live in Virginia, so know it wouldn’t survive our winters. Can I bring the flowering plant indoors before it gets cold and will it survive? Yes! This will do well indoors. You may see the foliage die back, but it is important that the roots stay warm. Reduce watering, but do not allow to dry out completely. Some tubers, like cannas or amaryllis can be dug and kept in a cool place for the winter, but curcuma are a little different and need to be warmer. 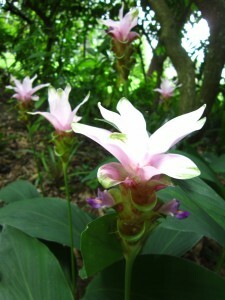 Keri, I inherited of pot of curcuma that had stopped flowering. When I went to remove the plant from the pot I discovered that there where a lot of roundish white bulbs – I assuming they are immature tubers that have not completely formed into the longer brown tubers. If I plant them will they develop and eventually grow? They should grow. 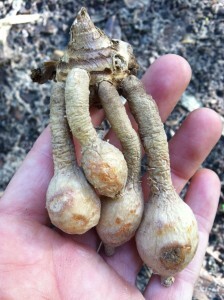 The tubers for curcuma kind of look like little octopus and the white balls on the end are part of that structure. I would go ahead and plant them in a sunny location that gets irrigation throughout the winter. Even though they won’t be growing you don’t want them to completely dry out and suffer. I would suggest planting in a pot that will give it some room to grow but still small enough for you to move inside in the fall. It won’t need light, but a cold garage or basement would keep it from getting too cold. The leaves will yellow and die back to the soil in the fall so anytime after that you can move it. Just a note: Be patient in the spring! These tropical bulbs tend to be on the slow side. I just bought my first Curcuma. I couldn’t resist and think I’m going to go get others in different colors. I live in the Atlanta area. My question is can they be left outside year round or do they have to go inside during cold weather. I’m debating, ground or pot. I would plant this in a pot that you are able to move into a basement or garage for the winter. Curcuma goes dormant in winter, so don’t be alarmed if your plant starts to have yellow leaves in the fall. The leaves will all disappear over the winter, but resprout again in the spring and bloom again in the summer. How do you separate to grown more from the original plant, or will it multiply on its own and do you then separate them ? Good question, Alvina! I think you will start to see your plants getting more full over time. Because of their octopus-like roots, it is going to be difficult to cleanly divide. My suggestion is to let the plant get quite large over time and try to divide in half by gently prying and loosening the soil. I have had curcuma for 3 years, repotting every spring. I live in northeast Florida so I bring them into the garage once it start getting cool. Is it better to leave them in the pots or can I remove them and put them in one big container? To avoid these tender bulbs from drying out too much I would suggest leaving them in the pots until spring. It will require much less effort than monitoring the moisture in exposed bulbs. I planted curcumas for the first time last year. They were beautiful! Had to dig them up because of a septic problem and now I have hundreds of rhizomes with the tubers attached. My question is, now what? I have washed off the dirt and separated the tubers. Can I just keep them in peat moss until I’m ready to replant them or can they just stay in the washed off form until then? If I want to give some away do I need to pot them? Most importantly how many of the rhizomes should I plant in each hole I dig? Will one rhizome just produce 1 flower? I live in Ft Myers Fl, but I know nothing about this area and when, or how to plant things. I’m eager to learn. I would keep them in peat moss until you are ready to plant because these bulbs tend to be very sensitive to drying out. I would share these with friends by just giving them the bulbs in their loose form– you won’t have to worry about pots of soil spilling in the car! If you are going to plant them in a row I would suggest digging a trench and then spacing them out every 6-12″. If you are doing groups, then I would dig a large hole and spread them out in that space. Once your plants get established I think you can look forward to several flowers per rhizome!